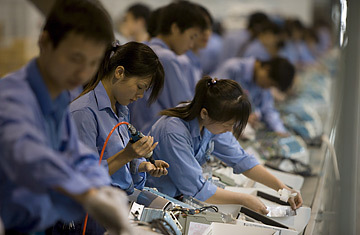 Workers assemble domestic air conditioning units on a production line of the AUX Company. AUX, a joint venture between Mainland China, Taiwan and Hong Kong investors, is a major appliance manufacturer with a diverse range of products from white goods to mobile phones. On a warm Friday afternoon in June, about 50,000 boxes of toothpaste got their last squeeze inside an industrial trash compactor in Homestead, Fla. They were yanked from the shelves of discount stores and bathroom cabinets after a nationwide recall warned that the toothpaste contained a chemical, diethylene glycol, that could lead to kidney failure. Francisco Botta, who distributed the toothpaste for his family's wholesale business in Miami, stocked his warehouse bathroom with the stuff. "I used it every day," he says. "I told everybody to stop."